The allure of hiking, seen here in the Mt. 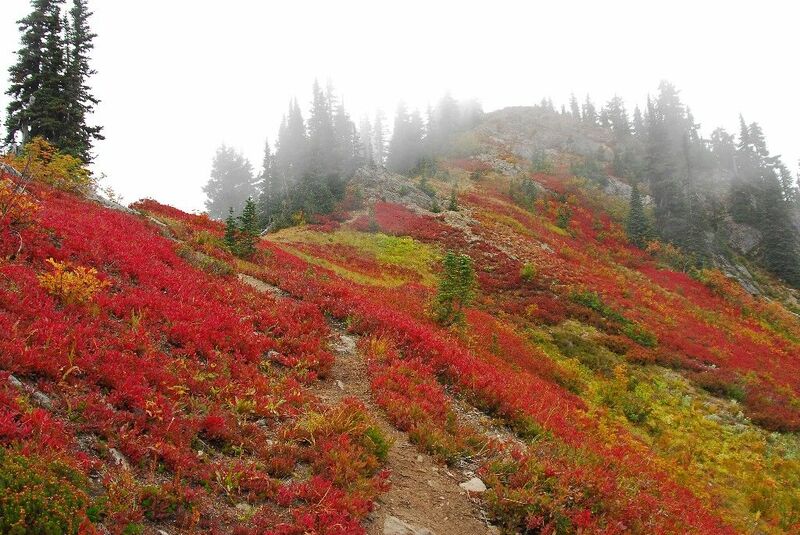 Baker Wilderness, Washington, runs deep. It happened, of course, in Boulder, Colorado, in a boutique café festooned with prayer flags. As two scruffy-chic climbers wrapped up recounting their weekend adventures, the taller one admitted that Sunday contained “just” a short hike in the Indian Peaks Wilderness instead of a balls-out multipitch climb. “You mean an ‘approach,’ but, like, without the climbing at the end?” his friend interrupted. They both snorted. Then they left to go clean their cams or do pinkie pull-ups or something. Sadly, such derision for the greatest outdoor discipline of all time is not rare. In fact, it’s common. In fact, hiking is often treated as the fallback, the annoying younger sibling, the safety school. Like most backpackers, I possess a multisport heart: I ski, climb, and paddle whenever I can. But to me, nothing remains as blissfully uncomplicated, varied, and deeply rewarding as walking. As an evangelizer for it, I seethed a bit in that Boulder café and the few other times I’ve heard people knock backpacking as uncool. Hiking, after all, is the original outdoor pursuit. Why can’t it get a little more respect? On some level, I get why it’s easy to denigrate hiking as nerdy. Climbers see their heroes dangling in retail-store wall art. Skiers get movie theaters packed with wannabes worshipping sick lines and impossible descents. We get trail names like Buns N’ Roses, people who still exalt external-frame packs, and khaki cargo pants—that also zip into shorts! Leave No Trace is cool, but does anyone need to enforce it like a hall monitor? Readers of this magazine know, of course, that hiking leads directly to happiness. And the rest of the world knows, too, whether or not they know they know. Case in point: dating apps. Swipe right through the mountaintop glory shots and wilderness poses in Tinder and it’s clear that, actually, hiking is better than cool. It’s hot. Hiking prowess, it turns out, might actually help us determine who we’d like to go home with. Biologically speaking, it’s what humans do best. We can’t outclimb monkeys or squirrels, and we can’t outsprint even an overweight deer. But we can outhike them all; we are evolution’s undisputed champions of endurance. Our hunter-gatherer ancestors, all massive glutes and elastic ligaments not present in apes, walked long distances over golden savannahs, rocky mountain passes, and sandy deserts in pursuit of prey. Humans can bludgeon any animal with our endurance (plus, you know, a rock). That spirit informs our modern drive to follow an elk beyond the next bend in the trail, or, if we’re lucky, spy mountain goats on a far ridge. Sure, we’ve swapped chert-tipped spears for DSLRs with mega lenses, but there’s still satisfaction all the same. But what about the heart-pumping adrenaline surge offered by a wicked chute or a fingernail-peeling crag? Yes, those thrills are real and I acknowledge the skills needed. But hiking requires a patience that’s sorely missed in the modern world. It takes time and perseverance to get somewhere by foot. It takes even more of each, plus some luck, to see a predator like a grizzly in the wild and feel the food chain realign in real time. Between hike-assisted dating and Leo and Reese going on long walks on the silver screen, I think we’re already around the cultural bend. But we can always do more. Declare yourself a hiker, loud and proud. And if you overhear someone dissing a hike—beneath an arrangement of prayer flags or not—tell him or her the truth: Hiking makes us human.